You had me at "lasers." Audi already unveiled its advanced matrix laser headlights back in May when they made their debut on the R8 LMX. Although, technically they've been around a bit longer, as something originally developed for the R18 race cars which race at Le Mons. When people talk about race technology making it onto road cars, this is the kind of thing they mean. But while Audi hasn't really kept anything about the lights a secret, it will be now be covered in depth at CES. 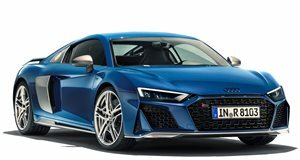 The Consumer Electronics Show is certainly an appropriate venue to talk about lasers, and it also makes sense that Audi would want to talk about the lights independent of talk about the R8 LMX, now that the commotion surrounding the car has died down a bit. Audi loves its headlights possibly more than any other automaker in the world, and we're curious to see whether the laser headlights will make it to the rest of the lineup. Or, more accurately, we're wondering how soon they'll make it to the rest of the lineup and how much they'll cost. Hopefully we'll learn at CES.